It’s hard to believe, but the Toyota Corolla has existed for most of the past 20 years in North America as a sedan only. This is a bit surprising given how well suited the compact car platform is for hatchbacks. 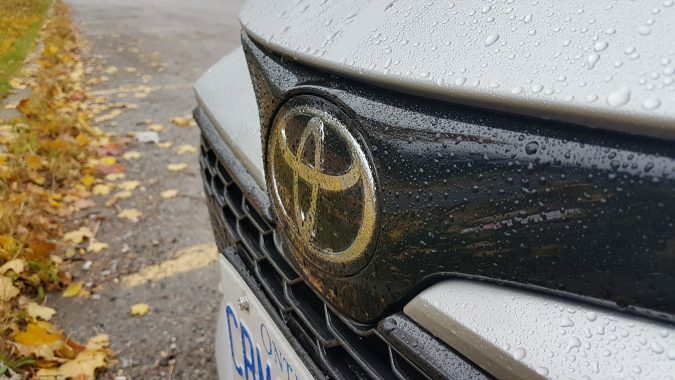 Now before annoyed Toyota aficionados fire off angry emails upbraiding me for my lack of knowledge, I am aware of the iM, the compact hatchback that wore Scion and Toyota badges on North American dealer lots during the 2015-2018 model years. Yes, I know it was badged as a Corolla iM for a couple of years at the end of its life cycle and it’s based on the global Auris, which is part of the Corolla family. But it was essentially a North American port of a car that was aimed primarily at outside markets. 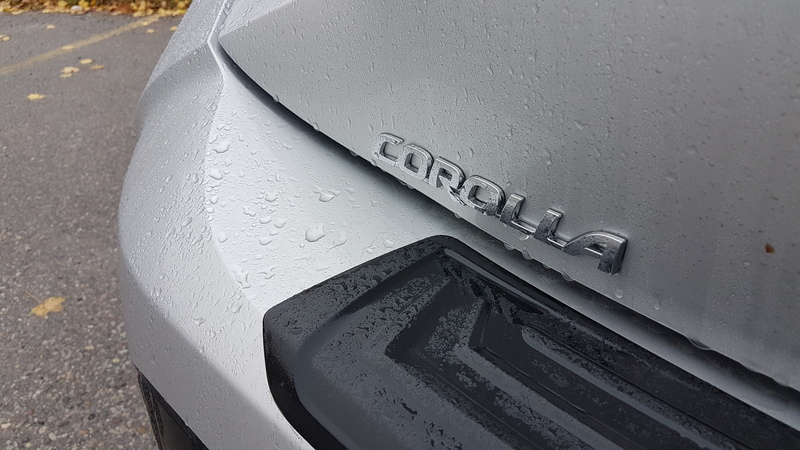 Things are quite different this time around, however, as the 2019 Corolla Hatchback is a truly global car and is badged as a Corolla in most world markets, and we North Americans have it from launch. Unlike the outgoing Corolla iM, the’19 Corolla Hatchback is a product of Toyota New Global Architecture (TNGA), the company’s centralized process for building more vehicles off common platforms that share many parts, thus reducing development cost and enabling products to get to market faster. TNGA vehicles also benefit from having a stiffer, lighter structure for better handling, more fuel-efficient powertrains, a lower centre of gravity and more dramatic styling. Toyota has stated that about half of its vehicles will be TNGA products by 2020. Among those already in the lineup are the Avalon, Camry, C-HR and Prius. The forthcoming 2019 RAV4 and 2020 Corolla sedan will also be built on TNGA platforms. 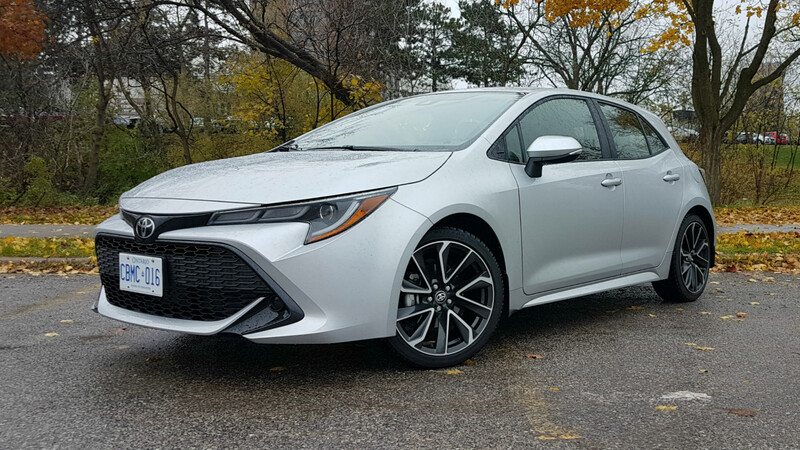 For Canada the Corolla Hatchback essentially comes two ways, with either a 6-speed manual or continuously variable transmission (CVT). Both are paired with Toyota’s new Dynamic Force 2.0-litre 4-cylinder engine that drives the front wheels and produces 168 horsepower and 151 lb-ft. of torque. 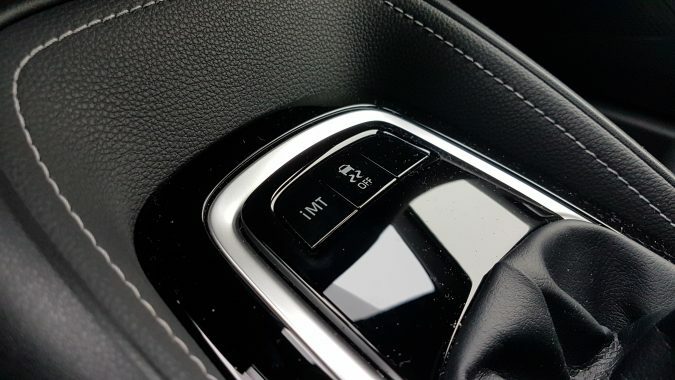 Extra kit can be ordered through SE and SE Upgrade packages for both transmission options, but if you have your sights set on a fully-loaded XSE, you’ll have to forego shifting your own gears because it’s only available with the CVT. 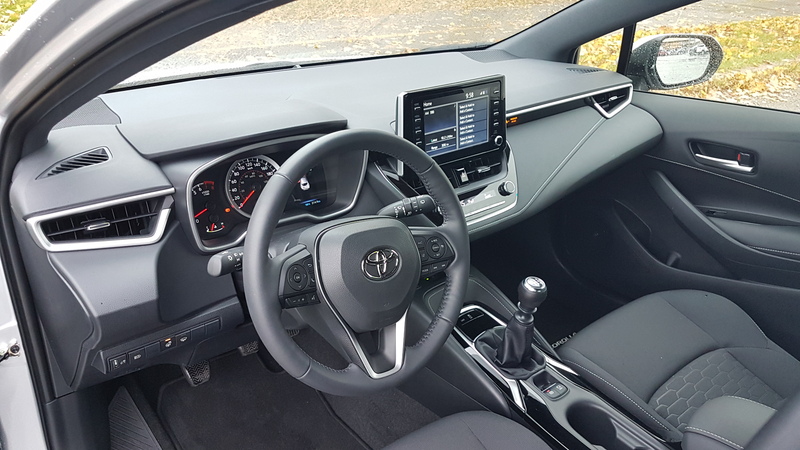 As someone who likes to shift his own gears, I asked Toyota Canada for a tester with a 6-speed manual and was furnished with one that came finished in Classic Silver Metallic and the SE Upgrade package which, for an additional $3,000, adds a heated steering wheel, heated front seats, 18-inch aluminum wheels, and cell phone charge pad among other features. 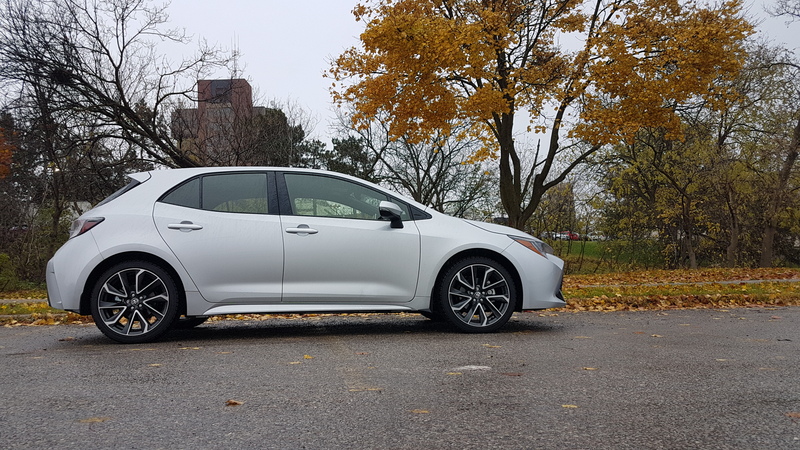 Creating cars with more emotional styling appeal has been a top priority for new and redesigned Toyota/ Lexus products over the past few years, and the Corolla Hatchback is a good example of this approach, particularly when viewed from the front. The wide, open-mouth inverted trapezoid grille and hawkeye-like LED headlights give the car an aggressive look that younger buyers are bound to appreciate. 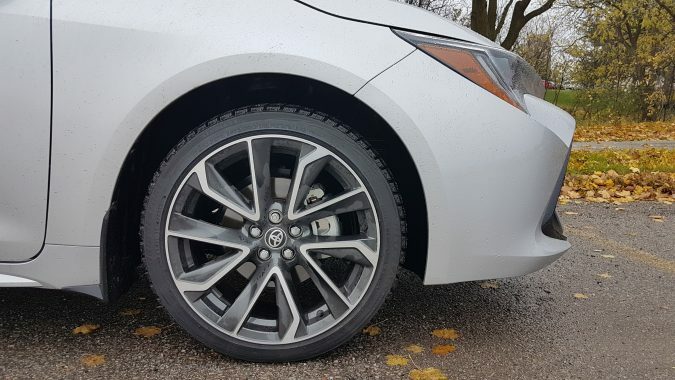 Elsewhere, short front and rear overhangs, combined with a beltline crease and lightly flared haunches give the Corolla Hatchback a low-set stance that looks handsome from a three-quarter perspective. At the rear, a large black plastic bumper insert, and roof-mounted spoiler dominate a busy looking hatch area that feels a bit over-designed with several shapes, lines and styles seeking to grab your attention. On the inside, my tester is well-finished and loaded with amenities. 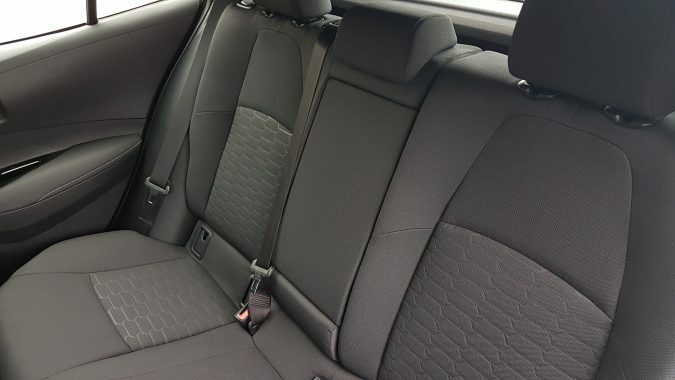 Cloth seats are becoming a bit of a relic these days (especially on press fleets), as leather and leatherette finished interiors continue to filter down into more frugal segments of the industry. 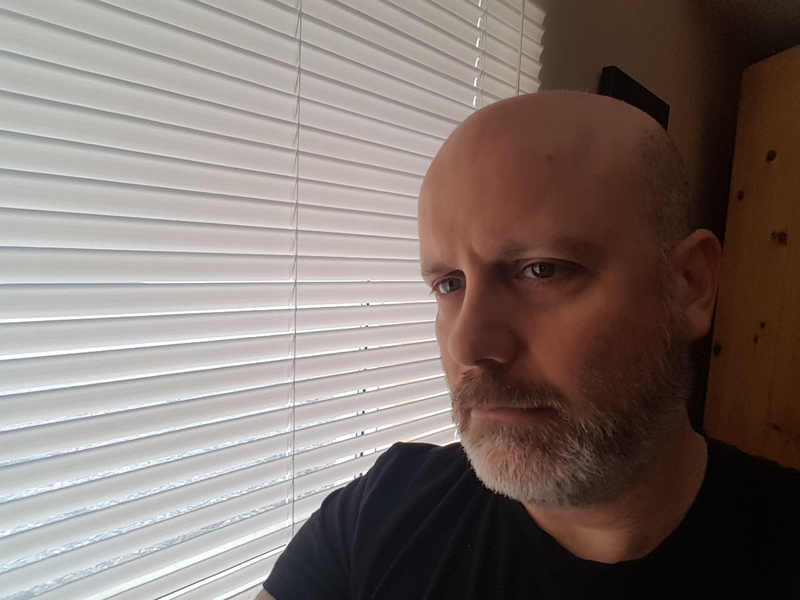 The ones in my tester, however, look nice in charcoal grey, are contoured to proved decent lateral support and are, as mentioned, heated. 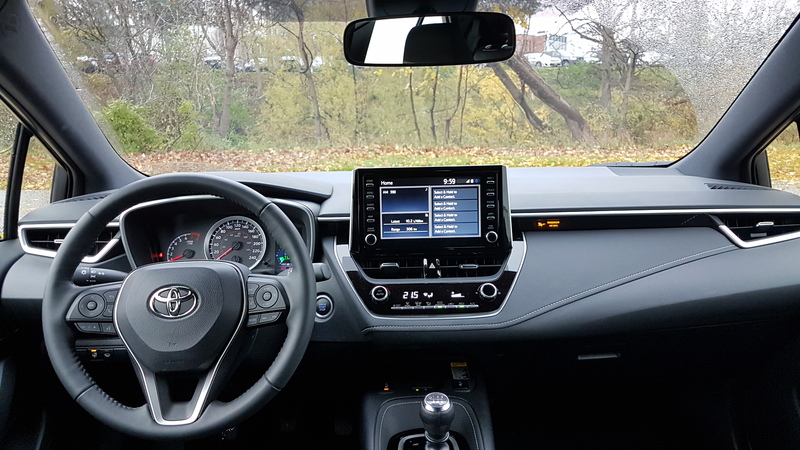 A leather-wrapped steering wheel and shift knob, along with clean analogue instrumentation and plenty of buttons and knobs make the Corolla Hatchback an easy car to adjust to one’s preferences. Everything is easy to find, use and adjust. Top marks to Toyota’s ergonomists for a job well done. 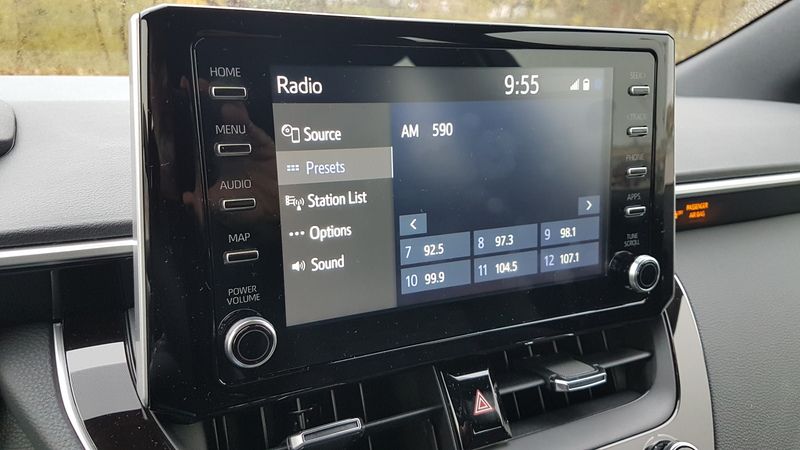 It’s not all joy, however, as Toyota insists on carrying on with Entune, its proprietary smartphone-driven multimedia system which is a rather inelegant solution. 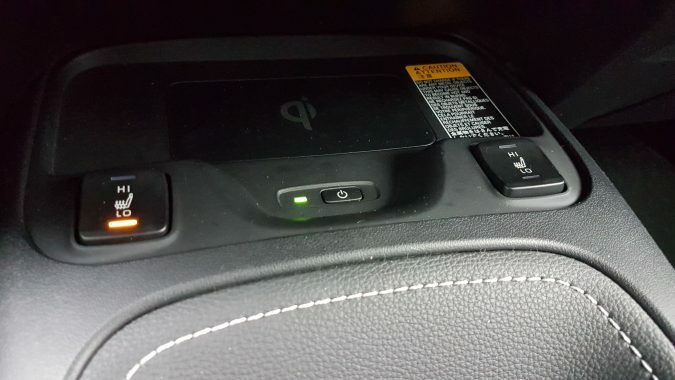 This situation is alleviated somewhat by the presence of standard Apple CarPlay, but if you have an Android device (as I do), you’re out of luck. Toyota is one of three mainstream manufacturers (BMW and Porsche are the others) that has yet to come to an agreement with Google that will allow for the adoption of Android Auto. Despite having a device that isn’t fully compatible, I downloaded the two Entune-related apps anyway to try the system out. Aside from Slacker, NPR One and Yelp, the other Entune apps were of the generic text-based variety that offer sports scores, weather and traffic information. They work fine, but because my phone isn’t supported, I couldn’t display the Scout GPS Link map on the car’s 8-inch display. Making matters worse, the screen’s graphics are fuzzy, low-res and offer a limited colour palette. Bottom line, if you have an iPhone the limitations of Entune are mitigated thanks to CarPlay. But if you have an Android phone, your multimedia experience in the Corolla Hatchback is significantly diminished. This is big negative given the availability of Android Auto in competitor vehicles. With that said, the stereo offers impressive fidelity and the Bluetooth works fine – my podcasts sound great. At any rate, enough with Entune. How does this thing drive? Very well, actually. 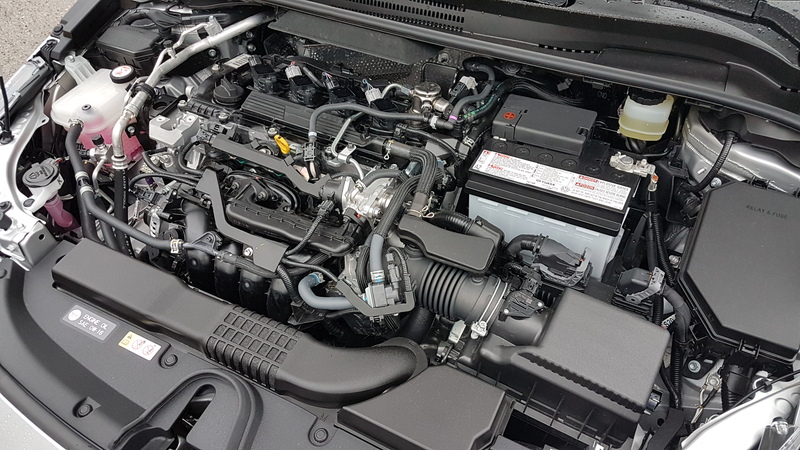 The 2.0-litre engine 4-cylinder doesn’t make use of turbocharging, so acceleration is not exactly seat-pressing, but it’s decently zippy especially in relation to the car’s size and weight. The clutch is light and predictable, and the shifter has a mechanical preciseness to it which makes rowing through the gears a breeze. An interesting feature with 6-speed manual Corolla Hatchback models is the iMT console button which, when activated, increases engine revs while downshifting to smooth out shifts and helps eliminate some of the jerkiness when changing gears. It’s designed to help drivers learning how to drive stick, but I put it on frequently during my week of driving because I like the rev bump sound. On the ride / handling front, the Corolla Hatchback impressed. I didn’t hustle it through an autocross course, but on public roads its handling felt reasonably responsive and well-sorted. The ride is on the stiff side of comfortable, but on most road surfaces it delivers the sort of experience one would expect from a small car – a bit jittery, but not too much. It’s quiet on the inside too, which was a bit of a surprise given small cars are traditionally noisy. Overall, there’s a lot to like with the 2019 Corolla Hatchback. It offers sharp styling, a comfortable well-designed interior and a fun-to-drive character, all at a reasonable price. I’m not a fan of Entune, but that situation will be largely remedied once Android Auto is available. Here’s hoping that happens soon. Another thing worth noting is the Corolla Hatchback’s confines are a bit tight. 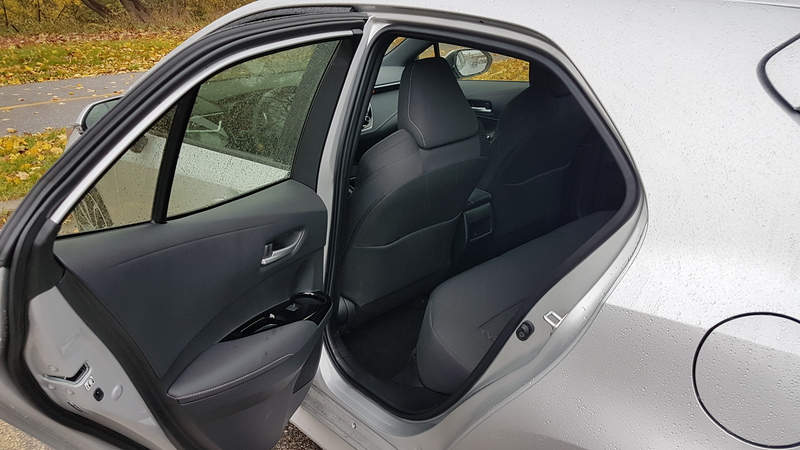 Head, leg and knee room is tight in the rear, and the door openings in the back are narrow. 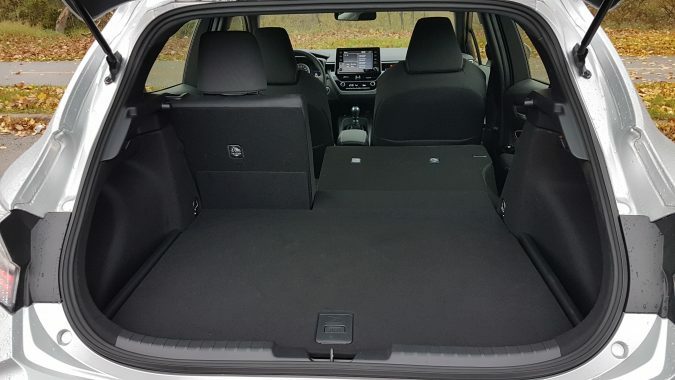 Cargo space is also surprisingly limited with the rear seats up, but I suppose that’s the price one pays for slick styling. The rear seats do fold down (60 / 40), however. 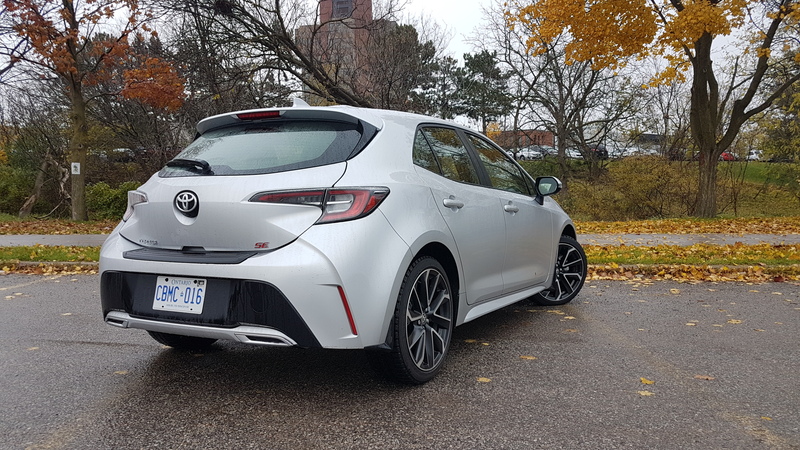 It’s not perfect by any means, but the Corolla Hatchback feels like a winner and as a result should find favour among many Canadian car shoppers.